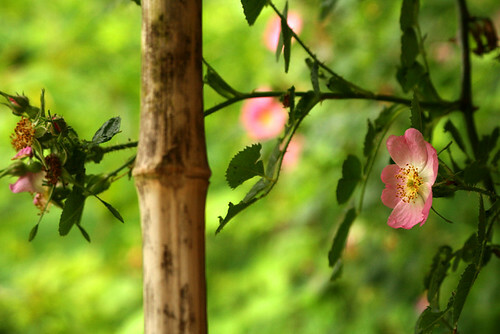 Trailing Roses, briar roses at Horton Bay in Mayne Island - a photo by Laríssa on Flickr. I remember quite clearly the first time I ever met Ayala and came across her fragrances. I was in my first semester of the Fashion Marketing Diploma program at Kwantlen Polytechnic University and I met Ayala at Portobello West very briefly while I was in the process of completing an assignment. I have always loved fragrance as more than just a sensory pleasure but also as a complex and powerful art form - the sense of smell is the sense that is most closely linked to emotions and memories. I was immediately intrigued by her unusual scent combinations (urban inspired Hanami and simplistic but powerful Roses et Chocolat were the scents that left the biggest impression on me) and by the stories that were behind each one and I never forgot about our discussion or her fragrances. I met Ayala again a year later at her Etrog tea-party after writing an article about her custom fragrances for a bridal fashion website. We talked about fragrance and bonded over the fact that we are both chypre-lovers (from Ayala's collection I particularly adore Rainforest and Ayalitta). I told her that I loved her product and that if I could ever be of help to her in any way that I would love to volunteer. Another year later and I am lucky enough to have the privilege of working for Ayala Moriel Parfums. While I was interning for Ayala in July, I was fortunate to be able to sit in on one of her classes and participate in the solid-perfume workshop during her five-day Floriental Perfume Course. While I do have a passion for fragrance and spend a fair amount of time researching fragrance myself, I knew very little about florientals and what key components make a scent a floriental versus a floral or oriental. 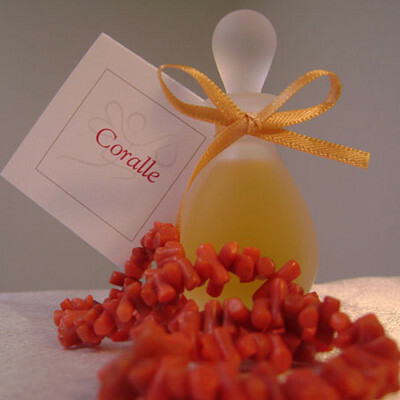 Many people think of floriental fragrances as being heavy, rich, ambery, and spicy. But truthfully, Florientals can be best described as a Floral-Ambery: a sub-category of the floral family, and the love child of two harmoniously mingled fragrance families - heady White Florals, and smooth Ambery Orientals. Opulent, smooth scents like Guerlain's iconic Samsara or Chanel's Allure often come to mind but floriental fragrances, while having a similar structure and similar notes, can vary greatly in smell and spirit. They can be light and sparkling, creamy and beachy or dark, smoky and seductive, depending on the composition and accent notes used. Floriental perfumes can vary greatly but are unified in their composition structure. Those who are familiar with fragrance know that notes are only a percentage of what leads to the final smell of a perfume. Florientals are more base heavy than other florals. Amber is always in the base, along with other heavier notes such as incense, sandalwood, vanilla, massoia bark or myrrh. The heart is where the richer flowers (roses, violets etc.) and white florals reside and the top is reserved for the airy citrus notes and lighter flowers (i.e. : mimosa), cool spices (i.e. 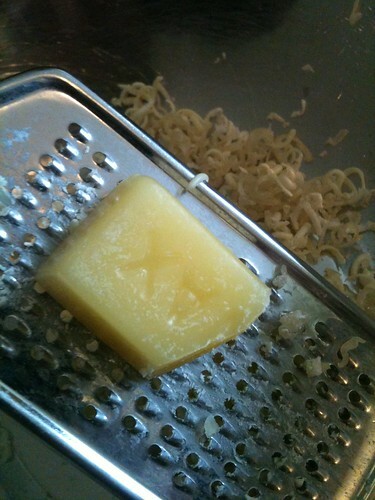 : coriander, ginger, cardamom), balsams and woods. Perfumers will play around with the composition of fragrances but that is the basic outline of what the formula for a floral-oriental fragrance would look like. It was fascinating to listen to Ayala explain how the different components and ingredients of a floriental perfume could work together. Perfume is often explained and described in terms of the ingredients or "notes" within a fragrance. Ayala stressed that the ratio of notes within a fragrance is as equally important as the notes themselves. There may be several different versions of a fragrance with similar or the same notes, but each version will smell entirely different based on the amount of each note and the concentration. The subtle but distinct differences between fragrances of the same family was illustrated most vividly when Ayala began passing around different examples of floriental fragrances, some her own creations, some commercial perfumes, and some truly intriguing indie and vintage scents. 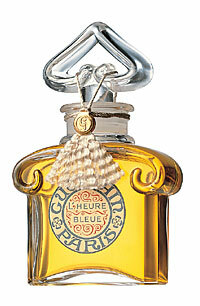 I was particularly intrigued by a vintage fragrance that she presented to us called l'Heure Bleue. The perfume was released in 1912 and I was truly surprised at how modern the fragrance smelled.When I used to think of vintage perfumes I would think of heavy abstract florals, thick spices, and animalic, aldehydic notes reminiscent of those on my great-grandmother's dresser. This perfume, created more than one hundred years ago could easily be worn and enjoyed today which made me appreciate the perfume and the perfumer all the more for being able to create a fragrance that can transcend time - not an easy task for an art form as personal perfume. During my time as a stand-in student of Ayala Moriel's I found that I most appreciated the way Ayala would connect science with more artistic side of creating a fragrance. What I mean by that is she would tell us about the chemical components of an ingredient and how that would affect a fragrance but would also describe it in imaginative and sensory terms that made it relatively easy for someone like me, with no background in science or chemistry to understand. I also appreciated the way that every lesson was illustrated with examples. If she was trying to show us how carnation blossoms smell similar to clove essences because of their high eugenol content, she would pass around the essences and have us describe any detected differences as well as similarities. Ayala thoroughly saturates you in the content of her lessons, urging you to use every sense while learning. Fragrant snacks (elderflower tea, floral-flavored cookies and bitterly rich dark chocolate), and garden walks allow her students to experience fragrance and explore the different components of fragrances in different ways. It is amazing how one flower, or spice, or balsam can produce essences with completely different aromas. The different facets of natural ingredients are fascinating and really made an impression on me in terms of how complex an art-form perfume-making is. It made me think of music or painting, where tiny brush strokes and notes combine together to create something abstract or simplistic but always emotionally/intellectually impacting. Everyday we are surrounded by different smells, some pleasant and some not so pleasant but they have a strong impact on our perceptions of our environment and on our memories. Fragrance can transport you to a different time, place, or emotional state depending on what you associate with different smells. 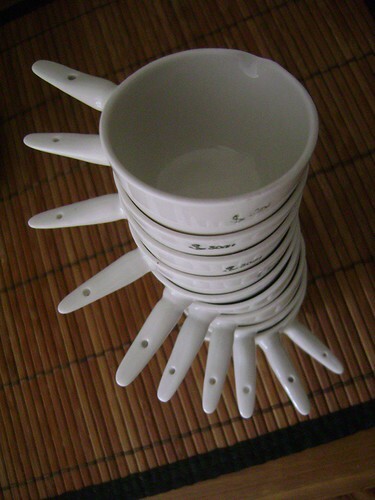 Ceramic casseroles for solid perfume making. The highlight of my week as Ayala's student was the solid perfume workshop. Using beeswax, jojoba oil, and essences we were encouraged to close our eyes and transport ourselves to a place that really represents ourselves and where we feel most alive, inspired, safe etc., a place that we would want to capture and carry with us always. For me that place is Mayne Island, a gulf island close to Vancouver Island. Briar roses, sun-baked blackberries, spruce, pine, broom and salty ocean air are the aromas that are closest to my heart. Using notes of Rosa rugosa, lavender absolute, vanilla absolute, wild frankincense, and ylang-yang I created a fragrance that reminds me of my home away from home and that smells just a little bit vintage-esque because of the frankincense. I named it Marion after my great grandmother who helped build my family's cottage on Mayne Island. It was a meditative but somewhat nerve-wracking experience because of how much a subtle change in the amount of each essence and even the slightest variations of notes can change the entire fragrance. The process of creating the solid perfumes felt similar to cooking and is definitely something I would like to explore for my own enjoyment in the future. Overall what I would say about Ayala's classes are that they are intensive, artistic and scientific, and very hands-on. These are not classes where you will simply sit, read, and memorize. Every one of your senses will be involved while taking her classes. Perfumery is a rich and complex subject and there is always a lot to learn. Ayala has been practicing perfumery for years and years and as she says, even she is learning on a regular basis. In my opinion, the mark of a good teacher is to be able to take a fairly complicated subject and to be able to explain it in easy to understand terms. As Albert Einstein said, "If you can't explain it to a six year old, you don't understand it yourself.". I learned a lot from my couple of hours as Ayala's student even without a base of knowledge to reference. Truly, perfumery is an art-form that should be further explored and celebrated. It is an incredible form of expression even for those who perhaps don't necessarily want to pursue it as a career. Not only will you develop a new creative skill and outlet but you will become more aware of the aromas and environment around you. I, for example, will never look at a tuberose the same away again after meeting and talking with Ayala about it (such a mesmerizing, multifaceted flower). I encourage anyone who has an interest in aromatherapy or perfume to take one of Ayala's courses, such as her Orientals week-long course from September 30th to October 4th 2013. Registration for this course closes Friday, August 30th at 12 noon PST. 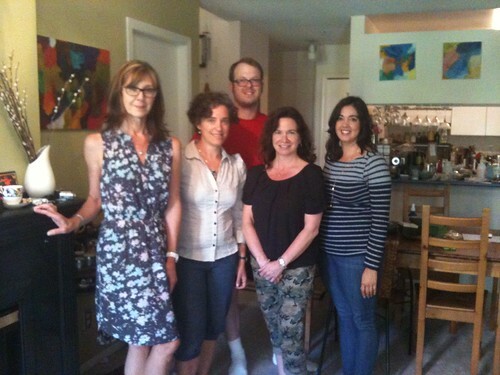 One of the things I've enjoyed the most last year, was collaborating with other creative and passionate business women in Vancouver, who I was fortunte enough to meet. As you may have already seen on BuenoStyle's blog, my 1st collaboration for 2011 is ready to launch this weekend! Christi York of BuenoStyle creates jewelry from vintage finds that she collects and assembles with her own design sensibilities and style: chains, beads, brooches, lockets and vintage charms. Walking up the stairs leading to her studio, the scent of antique furniture and wood-polish and hints of incense perfumed the air ever so gently. Her studio is located on Main street, with a large window to the street observing Shaktea tea salon (I'm so envious!). These wide windows bring in plenty of natural light so one can marvel at the beautiful miniscule vintage treasures, such a chains of pearls, antique brass clasps, rolls of vintage chains, crystal and glass beads, Bakelite flowers and old tarnished filigreed lockets - attractively arranged in wooden trays of print setters. So it only made sense to call the perfume that was going to complement BuenoStyle's jewelry with the name Antique Amber! Christi's favourite scent has been Cancer perfume from my (now discontinued) Zodiac collection. We felt that while the perfume was very appropriate for the style and personality of BuenoStyle, this name was misleading. So we formulated it for a solid perfume base, and changed the name to Antique Amber, so that even people who were not born under the sign of the crab will feel compelled to adorn themselves with this exotic amber perfume! Antique Amber is an oriental-ambery perfume with an old-world charm, like an antique wooden dresser filled with treasures: Luxurious amber resin, exotic patchouli-scented shawls, and remnants of jasmine perfume for an extra feminine touch. Borneol camphor and a hint of aniseed add a mysterious, lingering cool/warm intrigue. Antique Amber can be worn alone or can be layered with other perfumes for added depth mystery. 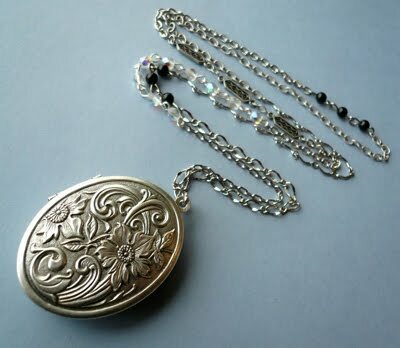 Antique Amber will debut tomorrow, encased in BuenoStyle's perfume locket pendants with vintage chain patchwork and crystals (each is a unique design - one of a kind piece!) at the Indie I Do show at Heritage Hall (Main @ 16th Ave), tomorrow - January 22nd, from 11am-5pm. Hope to see you there! Here are links to various sections on my Etsy shop, including items on clearance for VERY reduced prices! - All of my poison rings are displayed here, and there will be more to come! Check this section regularly to see what designs, colours and sizes are in stock. There are some rare ethnic and vintage rings, as well as brand new rings of contemporary designs. If you are looking for a specific size I'll always be happy to keep an eye out for you and try to find what you are looking for. These precious teas are flavoured and perfumed with the real plants - no artificial essences (or any essences, for that matter). For example: the Tirzah tea is perfumed with real osmanthus blossoms and linden flowers; Immortelle l'Amour is infused with real vanilla beans (you'll find the vanilla specs at the bottom of your cup! ); and Gaucho is perfumed with damiana leaf and clover flowers. Choose from the 5 different stones adorning this original teardrop shaped pendant. The innovative design allows you to enjoy the scent simply by wearing it on your neck: the heat of your body will release the scent gently. 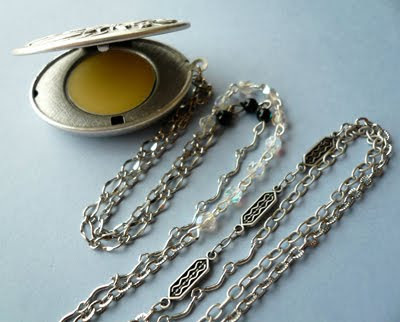 Using the perfume is simple and elegant: simply remove the plate (no need to take off the pendant for that), apply the perfume to wrists and pulse points, and return to the pendant. There isn't a better way to carry your perfume while traveling and enjoy it even in the most crowded places while disturbing no one (which cannot be said for spray perfumes...). For the solid perfume lover, here are larger quantities than offered in the perfumed jewelry. 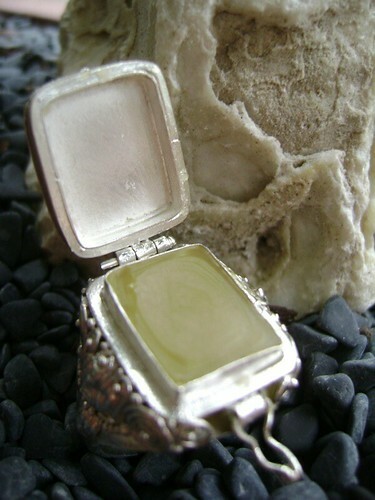 Choose from our ever-growing collection of vintage pillboxes and compacts. These solid perfumes won't spill and are excellent for traveling and for applying in perfume-phobic places such as buses, airplanes and corporate offices. If you do buy from my Etsy shop, you will receive a free sample of my new soliflore perfume Gigi. Also - don't forget to leave a feedback! Please pass this along to all your craft-hounding friends and fellow perfume lovers. Check out AyalaMoriel.com for the two new collectibles - a carnelian poison ring filled with Palas Atena solid perfume, and a beautiful vintage pillbox with carnation illustration, bearing within the solid perfume version of my new soilflore, InCarnation.